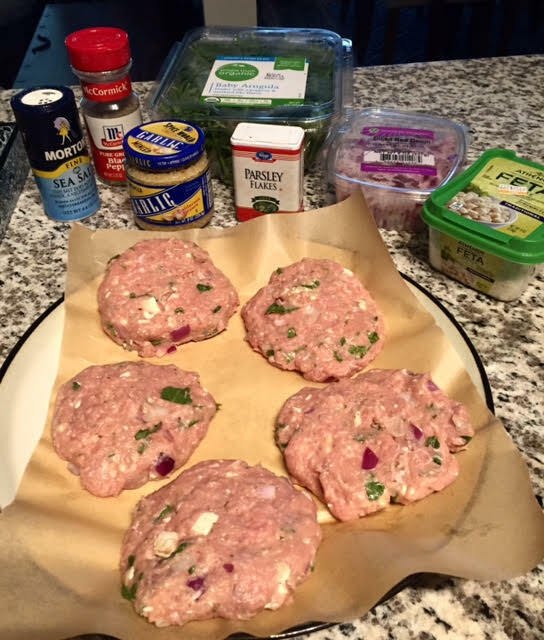 Add turkey, chopped arugula, feta cheese, red onion, Dijon mustard and garlic into a medium-sized bowl. Crack the egg into the bowl and mix together. Season with parsley, sea salt and pepper to your liking. Form into 5 patties and cook over stovetop or grill until browned on each side. Combine olive oil and seasoning in a medium-sized bowl. Wash the sweet potato; you can either peel it or leave the skin on. Cut into 1/4 in. strips and toss into the seasoning mixture. Place the sweet potato fries on a cooking sheet and bake for 25-35 minutes at 450 degrees.